We’re the Catholic Church in Central, North and East Basingstoke, Hampshire. Whether you’re visiting our churches or watching our services live on the web, we aim to be a welcoming and active community. We have a wide range of ministries and activities for people of all ages. We’re proud of our Catholic faith in the Risen Christ and keen to share it with you. Fr Chris was born in Gosport. While working as a manager of a large shoe shop, he was drawn to ministry and was ordained priest in 1995. 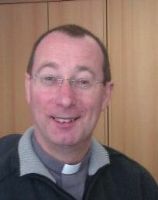 He has previously served in parishes in Windsor, Winchester, our neighbouring parish of Hook, and Bracknell. He has been our parish priest since September 2013. 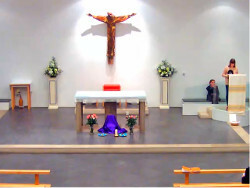 If you can’t attend Mass at St Bede’s, join us online and watch services via our webcam. Wherever we are, we are one community, together at prayer. Welcome to Basingstoke and to our parish! Please introduce yourself to our welcomers or our priests after Mass. If you wish for a Catholic priest or deacon to visit, please notify the ward staff or hospital switchboard. They will contact the on-call Chaplain who will determine the need and call one of the local clergy. All the work we do is funded by you. If you are a UK tax payer, please consider joining our Gift Aid scheme. If not, ask about our planned giving scheme. See more photos and news updates on our Facebook page. You don’t need a Facebook account to view our page.